Our milkweeds that we planted on Butterfly Bank (a small corner bank of our property), spread more each year. They look so healthy. I love the smell of them ... like lilacs or hyacinths. Milkweed is the only plant that the monarch caterpillar will eat, so habitat for them to reproduce has become critical as more and more fields are excavated without a concern for native plants to be moved or saved where possible. There are many varieties of Milkweed depending on the area of the country or world you live in. 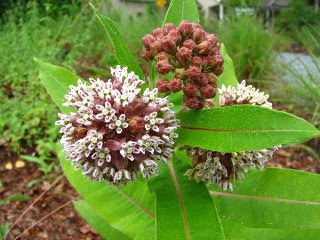 You can help by joining the Monarch Watch and planting a few milkweeds in your landscape. We got ours from a nearby field that they were going to clear to build a house. 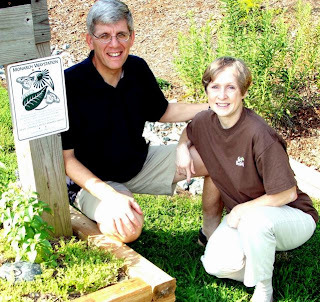 They transplanted well and we've shared seed with neighbors and planted more ourselves. Once you get a few plants established they will spread by root themselves. We became a Monarch Watch Waystation by establishing the plants they need to survive. As winter ends and the days grow longer, the Monarchs become more active, beginning to mate and often moving to locations lower on the mountainsides. They leave their Mexican roosts during the second week of March, flying north and east looking for milkweed plants on which to lay their eggs. These Monarchs have already survived a long southward flight in the fall and winter's cold; they have escaped predatory birds and other hazards along the way, and are the only Monarchs left that can produce a new generation. If they return too early, before the milkweed is up in the spring, they will not be able to lay their eggs and continue the cycle. The migrating females lay eggs on the milkweed plants they find as they fly, recolonizing the southern United States before they die. Soon the first spring caterpillars hatch and metamorphose into orange and black adults. It is these newly emerged Monarchs, the offspring of the butterflies that made the fall journey, that recolonize their parents' original homes. Summer Monarchs live a much briefer life than the overwintering generation; their adult lifespan is only three to five weeks compared with eight or nine months for the overwintering adults. Over the summer there are three or four generations of Monarch butterflies, depending on the length of the growing season. Since each female lays hundreds of eggs, the total number of Monarch butterflies increases throughout the summer. Before the summer ends, there are once again millions of Monarchs all over the U.S. and southern Canada. If you'd like to be involved in the Monarch project, here's the website for more information on how you can attract these butterflies and provide for them to reproduce and continue to give us the awe and wonder that they do when they come through our gardens. Monarch Butterfly Watch - Join In!